What boosts the spirits more than our furry friends? The Naples Art Association’s newest exhibition, Dogs I’ve Nosed: Photography by Jack Kenner, honors the special wet noses and wagging tails in our lives. A reception with the artist is on Sunday, March 10, 2013 from 1 p.m. to 3 p.m. at Physicians Regional Healthcare System at 6101 Pine Ridge Road in Naples. The exhibition will be on view through July 22, 2013. Admission is free. Guests are asked to please leave pets at home when they visit. Kenner used to mainly specialize in industrial and scientific photography before reconnecting with his passion for animals. Kenner also owns a gallery located in Memphis, Tennessee. Locally, his work was previously seen at the Naples Art Association’s 2012 Naples Fall Fine Art and Craft Festival and 2013 Downtown Naples New Year’s Art Festival. Dog’s I’ve Nosed: Photography by Jack Kenner features a combination of thirty black & white and color images. The exhibition is installed on the second floor of the atrium lobby with additional photographs displayed on the ground floor in the coffee shop, registration area and by the pharmacy. Gallery hours are Monday through Friday from 6 am-8 pm and Saturday and Sunday from 9 am-8 pm. Physicians Regional Healthcare System is located at 6101 Pine Ridge Road in Naples. Artwork on temporary display at Physicians Regional Healthcare System supports the facilities healing environment and is presented for the enjoyment of patients, visitors and healthcare staff. As part of a supportive partnership between Physicians Regional Healthcare System and the Naples Art Association at The von Liebig Art Center, three exhibitions are installed annually on the Pine Ridge Road campus. The Naples Art Association, a 501(c)(3) nonprofit organization, was founded in 1954 by local artists with a mission to educate and promote visual arts in Southwest Florida. Through its programs, the Naples Art Association is dedicated to serving individual artists of all ages and skill levels, along their creative journeys. The NAA operates The von Liebig Art Center, located at 585 Park Street in downtown Naples. It’s open Monday through Friday, 10 a.m. to 4 p.m., Saturdays in season. Follow the Naples Art Association on Facebook here. The relationship between art and healing is a well established and often-discussed phenomenon. The Naples Art Association is in partnership with Physicians Regional Healthcare System (PRHS) to benefit patients, visitors and healthcare staff. Three exhibitions are installed annually at the PRHS Naples Campus at 6101 Pine Ridge Road. Fire and Water: Nature in Watercolor and Hand-blown Glass is installed on the second floor of the atrium lobby. Additional artwork is located on the ground floor in the coffee shop, the Clinic and in the lobby near admissions. 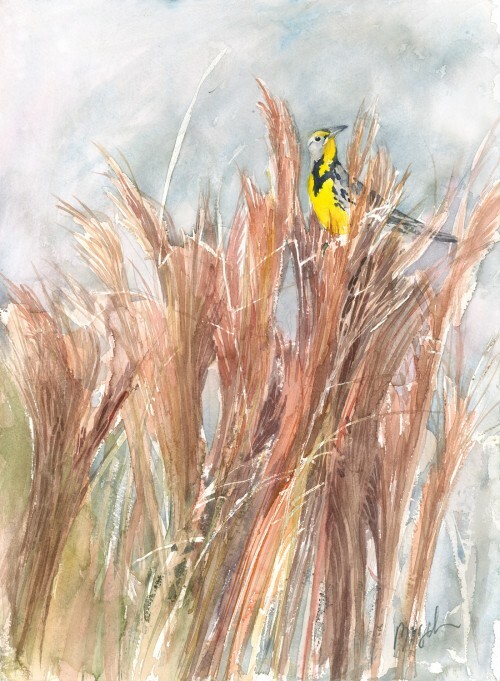 This exhibition is on view through Nov. 12, 2012, featuring original watercolor paintings by Southwest Florida artists Rod Busch, Barbara Groenteman and Marjorie Renfroe, and art glass by Beverly Albrets. Rod Busch shared his artistic inspirations and says that every painting session begins with questions. “For example, what do I want to say through the creative process that differs from what I say in an ordinary social context? Should I share my perspective as something temporary or permanent? Should I try to convey a concept?” Busch said. He works his answers into the layers of his work, deepening their meaning. 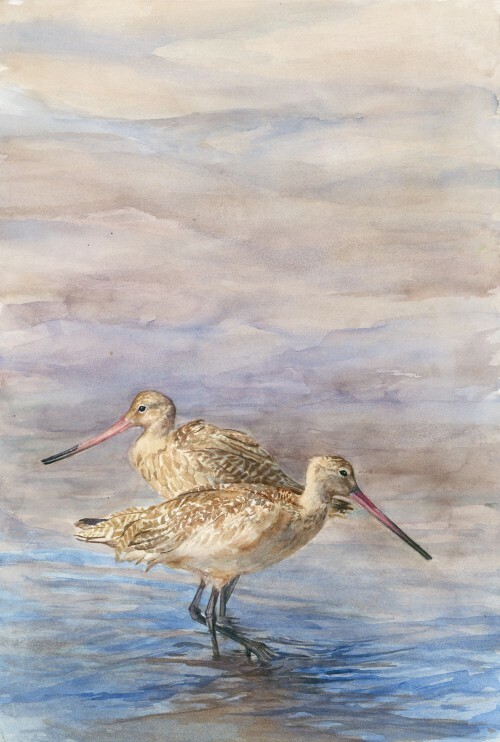 Busch uses watercolor because he says it lets his paintings “appreciate the moment” and it allows reflects light differently than other mediums. “Unlike media such as pastel, oil and acrylic which bounce light off the surface of the pigment, transparent watercolor allows light to bounce off the white of the paper behind the layer of paint. It literally enlightens the paint so that, like glass in a stained glass window, the watercolor has its own special glow. This characteristic coupled with the organic immediacy of the medium endears it to me. No matter how precisely or loosely one paints – with floods of water or mere dampness – the watercolor has a mind of its own. “Do it now, it calls out, “or forget about it!” he exclaims. “I love watercolor because it does all the beautiful things itself. I just limit where it does them on the paper by corralling, controlling and limiting where the watercolor paint can go,” Busch added. Follow Rod Busch on Pinterest. Learn more about other featured artists in this exhibition on our website and here on our blog in future articles.